A powerful South Atlantic weather system could propel Telefónica to within striking distance of current leaders PUMA in the final 24 hours of racing -- as dismasted Groupama attempt to secure the remaining podium position with a makeshift rig. 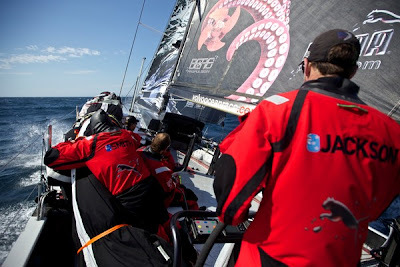 PUMA Ocean Racing powered by BERG were within 400 nautical miles of the Itajaí finish line at 1300 UTC on Thursday with a 63 nm lead over Team Telefónica, who have clawed back from a 400 nm deficit after suspending racing on March 31 for 17 hours to repair structural damage. 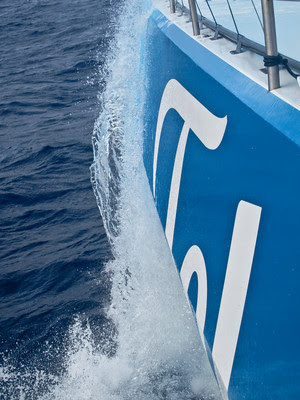 Local squalls packing gusts in excess of 50 knots have battered both teams, but their attention has now turned to a massive low pressure system in the South Atlantic predicted to travel north and compress the pair to within two miles of each other in then next 24 hours, Volvo Ocean Race meteorologist Gonzalo Infante said. Telefónica watch captain Neal McDonald said his team would do all they could to overhaul PUMA in the final few hundred miles of the leg. With a photo finish on the cards, PUMA skipper Ken Read said these were tense times for his team as they clung to the lead. “We’re terrified,” he admitted. “Nobody’s had any sleep in the last day. We’re working our asses off, that’s all we can do. Sometimes the wind gods bless you, and sometimes they don’t. Just hours after Groupama sailing team dismasted in relatively calm conditions while leading the fleet, PUMA and Telefónica were smashed by storm-force winds. “Groupama’s dismasting certainly makes us aware that the leg is by no means over,’’ Telefónica’s McDonald added. “That gust we had half an hour ago could have put us finishing in serious jeopardy. With the podium far from decided, Groupama sailing team were mounting their own comeback today from Uruguay’s resort port of Punta del Este, where they are currently constructing a jury rig as a temporary solution they hope could see them to third place. The French team suspended racing at 1542 UTC on Wednesday after their mast snapped level with the first spreader, about 10 metres above deck, as they led Leg 5 by 2.2 nm. Groupama were 59 nm from Punta del Este, and opted to motor to port. The team considered waiting for their spare mast to be sent from the Netherlands before stepping it, but this morning decided to continue under jury rig. Meanwhile, CAMPER with Emirates Team New Zealand were making “exceptional progress” on the repair of their damaged hull and were hopeful of a quick return to the racecourse. The team suspended racing at 0130 UTC on Tuesday before reaching the Chilean city of Puerto Montt at 2240 UTC that day. “Progress right now is exceptional,” shore manager Neil Cox said. “We’ve got back to ‘ground zero’, our starting point, and now we’re beginning to piece the puzzle back together. “The state of the boat was actually a lot better than I’d hoped,” Cox said. “You envisage all kinds of things, and we see the photos sent off the boat, but you don’t know the full extent of the damage. Cox said his six-strong team had worked round the clock to carry out the repairs in the shortest time possible. The most recent ETA for the leading pair is 1600 UTC on Friday, April 6.